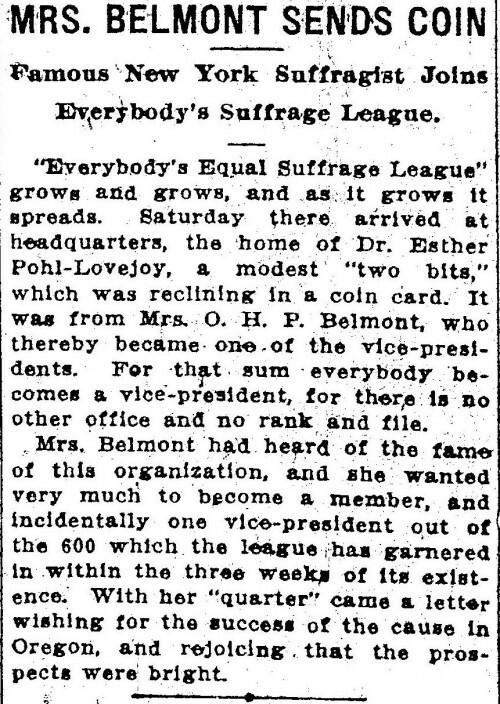 “Everybody’s Equal Suffrage League” grows and grows, and as it grows it spreads. Saturday there arrived at headquarters, the home of Dr. Esther Pohl-Lovejoy, a modest “two bits,” which was reclining in a coin card. It was from Mrs. O. H. P. Belmont, who thereby became one of the vice-presidents. For that sum everybody becomes a vice-president, for there is no other office and no rank and file. Mrs. Belmont had heard of the fame of this organization, and she wanted very much to become a member, and incidentally one vice-president out of the 600 which the league has garnered in within the three weeks of its existence. With her “quarter” came a letter wishing for the success of the cause in Oregon, and rejoicing that the prospects were bright. ANTI-SUFFRAGISTS DECLARE THE REPORT IS A GRATUITOUS FABRICATION AND WITHOUT FOUNDATION. Wilson is the author. That pamphlet is issued by and bear the name of the Oregon State Association Opposed to the Extension of the Suffrage to so that the statement that it was issued by any other person or organization was a gratuitous fabrication, and known to be such by all persons making it. “It has become the fashion for suffragists to attribute all their defeats to the ‘liquor men.” This has been the cry In Ohio, and, after the successive majorities rolled up against them, in Oregon. As a matetr of fact, not one of the six suffrage states has prohibition, and in a recent map published by the national W. C. T. U., Oregon stands out conspicuously dry among the surrounding wet and suffrage states. “Mrs. J. F. Bailey, president; Miss Failing, first vice-president; Mrs. R.W. Wilbur, second vice-president; Mrs. Wallace McCamant, treasurer; Mrs. Eleanor Gille, secretary; Mrs. H. W. Corbett, Mrs. A. K. Rockey, Mrs. C. H. Lewis, Mrs. David Loring, Mrs. J. B. Montgomery, Mrs. W. C. Alvord, Mrs. Gordon Voorhies, Mrs. R. W. Lewis, Mrs. James N. Davis, Mrs. Alma D. Katz, Mrs. S. T. Hamilton, Mrs. Herbert Holman, Mrs. C. A. Johns, Baker; Mrs. J. H. Templeton, Prineville; Miss Bush, Salem; Mrs. W. I. Vawter, Medford; Mrs. Elizabeth Vockey, Ashland; executive committee Mrs. E.H. Shephard, Hood River; Mrs. A. J. Richardson, Joseph; Mrs. J. M. Connell, Miss Rita Alderman, Falls City; Mrs. M. K. McFarland, Airlie; Mrs. F. B. Harlow, Troutdale; Mrs. George T. Flavel, Astoria; Mrs. W. S. McFadden, Corvallls; Mrs. Dun O’Neill, Oregon City; Miss Emily Loveridge; superintendent Good Samaritan hospital, Portland. Suffragists to Present “How the Vote Was Won” Tonight. A play staged under the direction of a professional dramatic coach at the Bungalow Theater, free of any charge or collection, and to which people are asked to come, such is the unusual feature of the entertainment provided for the public by the College Equal Suffrage League, which has arranged for the presentation of the suffrage play, “How the Vote Was Won,” commencing at 8 o’clock tonight. Other attractions, all of a humorous nature, with the exception of an address by Mrs. Sara Bard Field Ehrgott, will be given in addition. The musical part of the programme is in charge of Mrs. Frederick Olsen, while readings will be given by Miss Charlotte Banfield, Mrs. Helen Miller Senn and Walter Gillard. The play itself, which is an English one, produced at one of the London theaters, and which has been given in all parts if the United States, is staged by Mrs. Emma Watson Gillespie, who has picked a company, all of whom have given the play in various suburbs. Horace Cole, a clerk, Blaine Peabody; Ethel his wife, Miss Maud Hollinger; Winfred her sister, Mrs. Lou Ellen Cornell; Agatha his sister, Mrs. Lillian Downing; Molly his niece, Miss Opal Hedrick; Mme. Christine his distant relative, Mrs. Pearl Lotspeick; Maudie Spark his first cousin, Miss Echo Zahl; Miss Lizzie Wilkins his aunt, Mrs. Maud Johnson; Lily his maid of all work, Miss Carol Mitchell; Gerald Williams his neighbor, Walter Gillard.